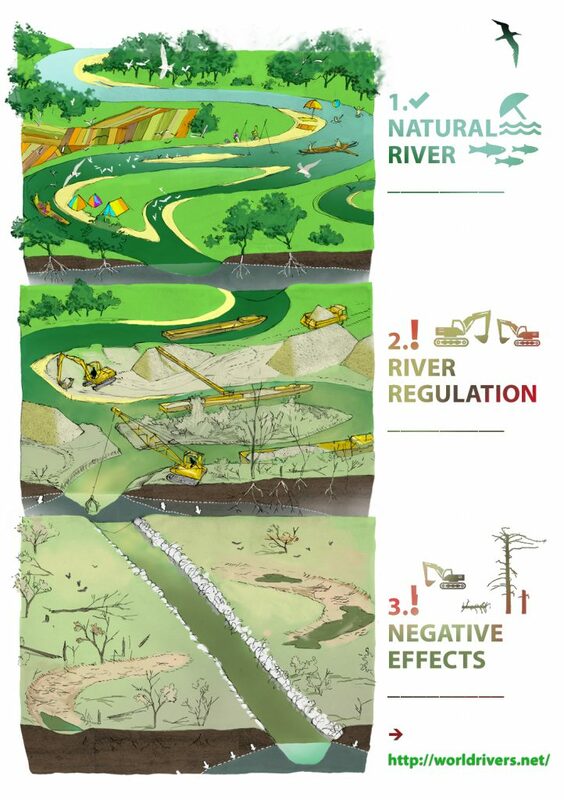 The adverse effects of the river regulation - World Rivers Become a Patron! River regulation is altering of the course of the rivers, embanking it in the stone or cement and reducing its dynamics. Chiefly done for the erosion and flood protection, river navigation and irrigation, but it has backfired with profound negative consequences. Moving ever closer to the rivers, people suffered from the erosion and floods. 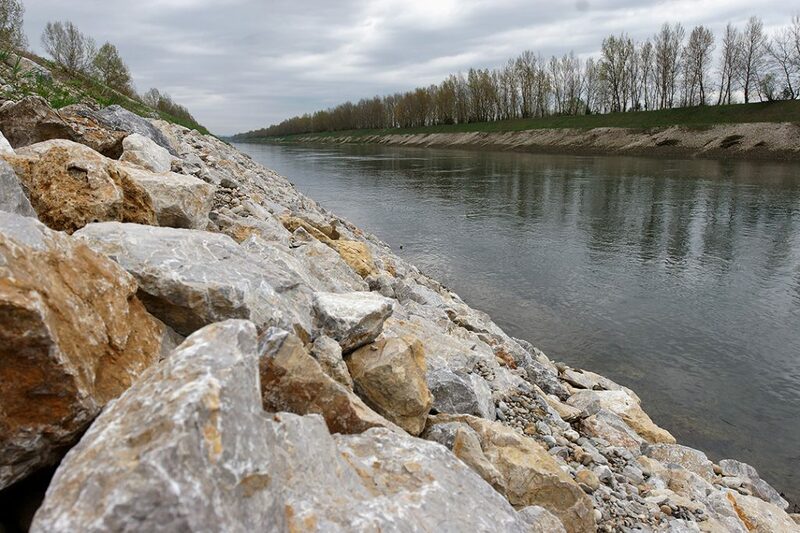 To protect themselves, also to promote river navigation, irrigation and other needs people have started to regulate streams – straightening the course, embanking it with the cement and rocks. But, it has turned out that it has drastically. What is the river regulation? In a broader sense, it is the alteration of the entire riverine system, all dynamic processes and usually turning the natural floodplain to the urban or industrial area. The river is engineered to the needs of the man. There are several ways to do this. The river is usually confined on a static course. To achieve this, the river banks are fixed by the embankment. These resistant banks will stop the lateral river erosion. Rip-rap, is rock, cement, stone or modern materials used to prevent water (or ice) erosion. It is made from a variety of rock types, commonly granite or limestone, and occasionally concrete rubble from building and paving demolition. River groynes (spur dykes, wing dykes, or wing dams) are often constructed nearly perpendicular to the riverbanks. They divert the river current from the unwanted course, effectively hindering the river meandering. Groynes are primarily used on the big rivers for navigation. To save the time and fuel for the boat transport, the river is “straightened”. In other words, the meanders are cut off. For example, the Mississippi River has been considerably shortened over the years by U.S. Corps of Engineers and others. Dikes, levees or dams are used for flood protection. These artificial earth walls are erected on the sides of the river, impeding the overflowing of the river. However, many are too close to the river, reducing the storing capacity. Ripraps, groynes, dikes are just the basic river regulation toolset. Many other techniques exist like diverting canals, floodgates etc. In general, the complex lowland meandering river with a floodplain is reduced to a static, straightened channel with artificial stone or cement banks. The dikes are often on the very banks, and the floodplain is either disconnected or wholly urbanized. Forcing the flowing water in an artificial channel is bound to have unwanted effects. The loss of the biodiversity and the habitats is the typical outcome of the river regulation. Instead of the river with diverse landscape and habitats, we have artificial, uniform canal. It’s no brainer to see this. But, there are other problems, related to us people. Not able to erode the artificial stone banks, the water is shifting its energy to the river bottom. The regulated river is cutting its bed, lowering its position. The riverbed degradation is familiar to many streams in the world, and one of the main reasons for the river revitalization. Once again, it loses connectivity with its side channels, the floodplain and natural retention of high water. Even more dramatic, underground water column drops. Trees in the forest and crops then suffer from droughts. River regulation has other unwelcoming effects. Once, rivers fertilized the soils, but now people invest into artificial fertilizers that pollute soil, water, and air. River regulation on one side hinders small seasonal floods but could produce catastrophic one. The embanked river has lost its connection to the floodplain, and excess water accumulates only in the riverbed. After heavy rains upstream, the river might lose the capacity and is forced to spill, unfortunately sometimes in the settlements. Find out how this happens. Then, we lose the ecosystem services, the economic benefits of the preserved, natural river. Read more about what they are. New understanding of the rivers sees the vital role of the preserved floodplain. Read about How we can reduce the risk of the floods. Floodplain forest and wetlands not only withstand long-term floods but also are adapted to erosion. We only see the erosion side of the story, and we often overlook the sediment deposition. Without sediment deposition, the river would continually widen. This is clearly not the case. In preserved floodplain, with enough room for meandering, the river will only shift its course. Willows and poplars grow remarkably fast, sometimes more than one meter in a single year. The river has indeed eroded one bank, but depositing the sediment, it has created new habitat on the other that is restored in a decade! Of course, we need to protect our lives and property, but in nature, the river needs more space, both for erosion and flooding. Even in more urban areas, we should give it more room for these services. River restoration is a great way to achieve this!